Tuffy says: Roan Hayes is Standing at Stud. We own this studs dam and his sire is an own son of Leo Hancock Hayes owned by our good friends in Texas. If you like the HANCOCKS, then be sure to check out his mamas pedigree!!!! WOW IS THE WAY TO DESCRIBE WHAT HE THROWS! Look up his daughter RNF ROAN CEDAR or RNF DOC BLUE on our sold page to see his produce L. His dam has no Blue Valentine and is all Hancock bred. He is producing the kind of colts that make everyone take notice! Pretty, correct and full of conformation. Great bone and feet to carry his stature. 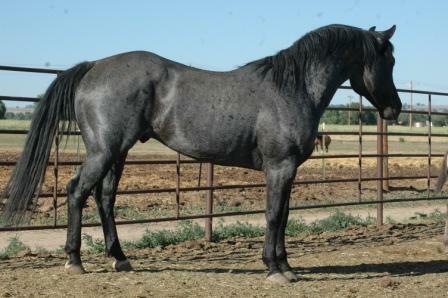 He is HOMOZYGOUS ROAN AND BLACK. NN ON HIS FIVE PANEL TEST! Freeze branded # 7 left shoulder, RNF left hip.